Sky Rc Proteus X524 Water Jacket. 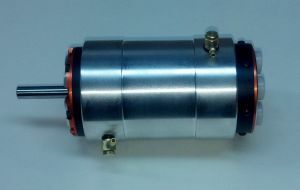 This jacket is designed to fit either the Proteus 56mm diameter x 110mm long motor. This Water Cooling Jacket has been designed for maximum heat reduction. At 90mm (3.55") long, the jacket is long enough to cool the motor well. Yet weighs less than 4.50 ounces. We picked high quality aluminum for the jacket to further help with the cooling, as the aluminum acts as a added heat sink. Than we added brass water fittings. Approx. 3.55" (90mm) long x 2.52" (64mm) in diameter.